Today FunkyVideoGames brings you a gaming set that includes gaming mouse, keyboard and headphones, and the best part is that all these three accessories comes in a bundle with a shocking price of $35.99. SportsBot SS301 Gaming Set has everything that a gamer wants. This SportsBot’s set comes with Logitech SportsBot’s Mouse, keyboard and headset. The SportsBot series is sleek and of high quality. Getting all three items for just the price of one can only be described as STEAL. These gaming accessories may not be the top of the line but you still can’t go wrong with this one. In SportsBot Gaming Keyboard, you have an option for Blue LED back light with breathing lighting effect and 3 levels of settings for low light conditions. This keyboard features dedicated multimedia keys to control volume, music, back to homepage and to check email. The keyboard also got a WIN lock key option to disable the Window key function for gaming. 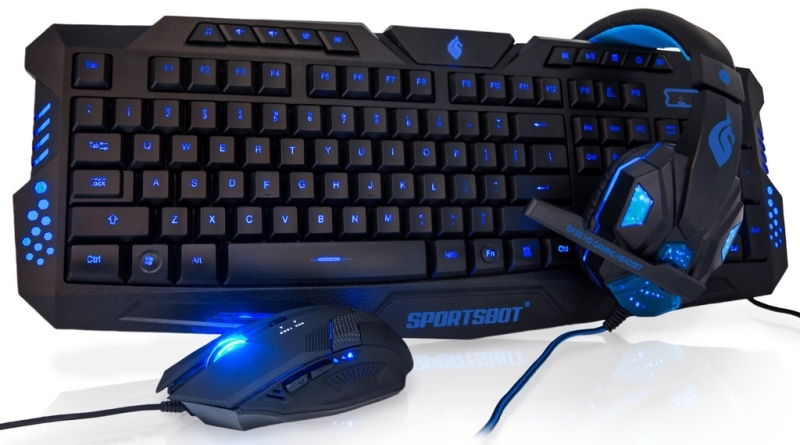 In SportsBot Gaming Mouse, you have a blue LED back light to match the keyboard and headphone. This mouse also has Easy-Access DPI button for changing the dpi settings faster. The optical sensor is pretty good in this mouse and really effective on most of the surfaces with high precision. In SportsBot Gaming Headset, you’ve got 40mm speaker driver to provide HQ sound and rich bass for best gaming and music experience. The headset is pretty comfortable and will definitely fit any head size and shape. It got soft leather earpads for comfortable longer gaming sessions. I have to say that SportsBot SS301 Gaming Set is the best gift for gamers under $50. Or if you just started gaming and really want something great for little price you can give SportsBot SS301 Gaming Set a shot. I’m 100% sure that this gaming set will not disappoint you because it is really great in terms of cost-to-performance.